WarpToggle creates a small floater with 2 buttons to either turn on - or turn off all space warp bindings. You have a choice of operating on either all objects - or only on selected objects. 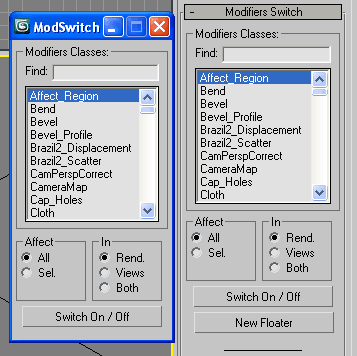 Very handy for speeding up viewport interaction if you are warping many or complex objects. Turn off the warps 'till you need em! Seems to work fine in Max v.7 - 2008, have not yet tested with Max2009, though it is a simple script, and should be OK.